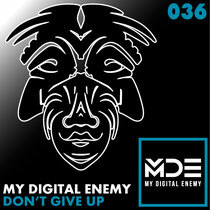 After just a few days on sale, My Digital Enemy’s ‘Don’t Give Up’ is already doing well on the Beatport house chart. For long-time producers Serg and Kieron, who have already enjoyed success with a string of releases this year, this latest track is yet another example of why the Brighton based duo have got their signature system-shaking house sound nailed to a tee. Gaining support across the board from BBC Radio 1’s Danny Howard, Steve Angello, Pete Tong and Tiesto, My Digital Enemy have been pushing a popular sound that seems to work on dance floors across the globe. With ‘Don’t Give Up’ out now on the pair’s very own Zulu Records and getting the thumbs up from the likes of Hard Rock Sofa, Swanky Tunes, Sister Bliss, Andi Durrant, Matt Smallwood and Marc Vedo, it’s looking likely that this offering will be joining the rest of My Digital Enemy’s recent releases in gaining support from their peers. Check it out below.